Don't want to sit through a group class? Have specific questions you want answered privately? Want the encouragement and reinforcement that you are on the right track? Want new ideas and skills to try? Then, a Parent Coaching seminar is for you! Teachers, parents, and grandparents, come explore research-proven methods for disciplining yourself and your child! Learn tips by the best in the field and share your ideas and concerns too! No judgments - only positive solutions for your parenting toolbox! Created by a certified parent educator, experienced elementary school counselor, child enrichment specialist, and the founder of Playground Diplomacy™ and Parent Child U®, this class is sure make the difference you are seeking and/or the reinforcement you deserve! Just a few of the many topics we will discuss include: child and brain development, speech and language, feelings-management, problem-solving, bully-busting, tattling vs. reporting, school, and more! Build a stronger, more positive relationship with your child and be the parent you always knew you could be! Be confident knowing you are helping your child be the responsible adult you know they can become! Ages: Birth - 5 yrs. Cost: $25, which includes $14 of home materials! Dates: Sat., Dec. 8, 9:30-10:20 p.m.
Parent Child U®: Kindermusik or Sign & Sing Birthday Package* We can do almost ANY Theme! Description: Parties usually take us at PCU 3-4 hours with prep, ordering and stuffing bags, travel, set-up, clean-up, time with the kids & our as one family put it, "priceless" fUn 35-45 minute Kindermusik and/or Sign & Sing music and story time circle led by a licensed PCU educator! · Theme, songs & gift bags planned with Parent Child University ahead of time so you won't have to worry! * All items subject to availability & more items available to choose from! 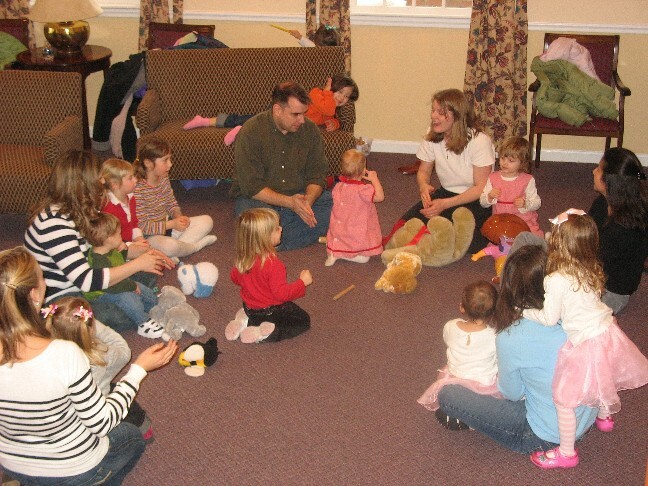 Kindermusik and/or Sign & Sing Circle with instrument play, story time, and MORE! impact their feelings and behavior. Classes begin 1/26-3/9 (skipping 2/16) at Fairlington Center. Private sessions at other locations. Taught by Beth Hardy, Ed. S., Certified Yoga instructor and School Psychologist. Open Your Internal Pharmacy. Learn about the keys, and the science behind your body’s internal pharmacy. You can help your body produce these custom-made medicines and be in charge of your health. Make Health Your Hobby. Understand how the body works and focus on making good choices for great health every day. Move Waste from your Waist. Waist size is a strong indicator of our overall health! Find out how to remove toxic waste and eliminate the health-harming chemicals that are produced by belly fat. Live Without Pain and Inflammation.Inflammation literally means the body’s immune system is on fire. Learn the primary causes, and ways to reduce inflammation throughout the body. body make its own (free) medicine! us and learn more at www.Transform5. digital materials and a CD. Visit www. in our newest Village curriculum! recent research in baby development. to see why parents LOVE our classes! One adult must participate with child. while reading, rhyming, and storytelling! Signing Smart® : Basics & Zoo! very young children and their parents. the class for your Animal Flash Cards. success of Signing Smart! Visit www. A Parent’s Strategy and Activity Guide. Parent Child U: Positively® Disciplined! for disciplining yourself and your child! parent you always knew you could be!